Puzzle games are among the most popular games played on smartphones and even before the development of our phones and apps. They challenge your brain and calm you down all at the same time — as long as there are no pieces missing of course. If you enjoy solving puzzles and you are looking for a new exciting puzzle game to challenge you, we searched and we found an incredible jigsaw puzzle games with hundreds of puzzles to solve. Mosaic Magic is an amazing jigsaw puzzle game that features gorgeous mosaic crafting experience, easy to play with one finger, just drag the pieces to assemble it and solve the jigsaw puzzles. 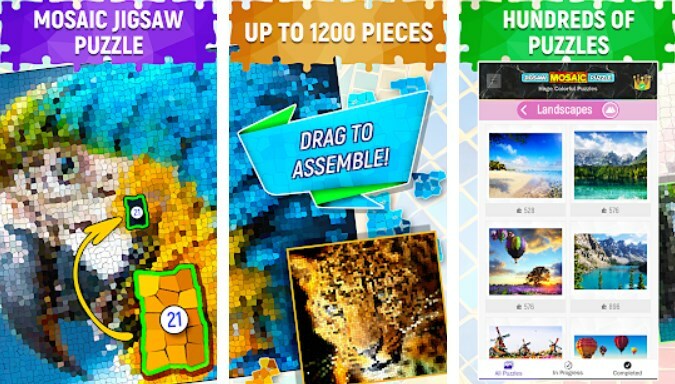 Developed for android and IOS users, this puzzle game offers an incredible innovative and unique concept of 3 mosaic pieces selection which is relevant to the player’s current screen. Highly addictive and exciting, this mosaic jigsaw puzzle offers each player to relax and enjoy the anti-stress experience with the colorful art style mosaics. This jigsaw puzzle game is not limiting you to one screen but is offering you the ability to scroll freely around the puzzles, to zoom in and out with a double tap or just a pinch gesture. Players can rotate the device too and play in the horizontal mode. Two modes are offered on each puzzle, the beginner suitable for kid with a regular grid of the mosaic tiles and the advanced more challenging and suitable for grown-ups. By turning off the hints by default and relying just on the shapes of the puzzle pieces the player can make each mission more challenging. Each solved puzzle can be zoomed out so the player can see the pure magic. As a reward for each solved puzzle, you will get a fascinating 3d time-lapse video that you can share with others. Super-moves, combos and power-up pieces are offered to make the game more exciting and to multiply your scores. The incredible library of jigsaws offers up to 1200 pieces and is updated constantly. Different puzzle categories are available to choose from like animals, pets, technology, fantasy and other. Your progress is automatically saved upon any interruption of the game. Download it on Google Play and App Store for free to solve the jigsaw puzzle and get an amazing 3d video award!